Auli, the winter sport destination, is nestled in the peak of Garhwal hills in the Chamoli district of Uttarakhand. Situated 16 kms from Joshimath, at an altitude of 2895 m, it is one of the most popular ski resorts in India. Auli's 7kms long sloped ranges with an elevation of 500m offers exciting skiing opportunities for both experienced skiers as well as beginners. The beautiful slopes covered with oak and coniferous trees against the backdrop of lofty snow clad mountains, heightens the spirit of the skiers. Auli can be reached by road or ropeway from Joshimath. Locally called trolley, this 500m long ski-lift system which is the longest cable car in Asia, connects Joshimath with Gorson, above Auli. A short distance beyond Gorson lies the hill of Gorson Top, which provides an excellent view of the giant mountain peaks like Nanda Devi, Kamet and Dunagiri. From Gorson, an 800m long chair lift travels to the base lodge that marks the starting point for all the ski runs. It is Auli's only chair lift that connects the lower slopes with the upper slopes. From there, the skiers can ski down to enjoy almost 20 km of virgin slopes of the unexplored terrain and others can walk down through the snow capped paths. 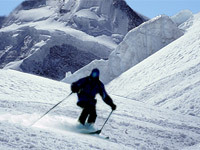 Sliding down on skis at a speed of 20-40 Kms per hour, provide a thrilling experience. Skiing and Tourist resort, run by Garhwal Mandal Vikas Nigam (GMVN), provides accommodation as well as all other facilities to the tourist. It has two snow-beaters imported from Germany which beat the snow to keep the slopes fit for skiing at all times. Auli is the venue of the Indian winter games. This skier’s paradise is an active destination for the ski enthusiasts. GMVN offers fortnight-long skiing courses for amateurs. This includes a 7 day non-certificate course and 14 days certificate skiing courses by qualified instructors from Skiing and Tourist Resorts, Auli and Indian Institute of Skiing and Mountaineering, Gulmarg. These courses are conducted from the month of January to March. Special provisions for day tourists are also available. All the skiing equipment are available with GMVN on hire including the most modern alpine skis, Nordic skis, gloves and goggles. As the weather of Auli is really chilled, tourists are advised to bring woolen clothing, socks, wind-proof jackets etc. Medical facilities, microwave telephones, wireless sets and walkie-talkies are also available. Another option for accommodation is the Cliff Top Club Resort. Auli's slopes are ideal for hosting skiing festivals and competitions of national and international standards. Winter games Federation of India organises championships in February or March, which adds charm to the experience of the adventure seekers. Apart from skiing, other attractions of Auli includes cable car rides, rope lifts and wonderful views of Himalayan peaks like Nanda Devi (7817 m), Mana Parbat (7273 m), Drona Giri, Trishuli, Hathi Ghora etc.